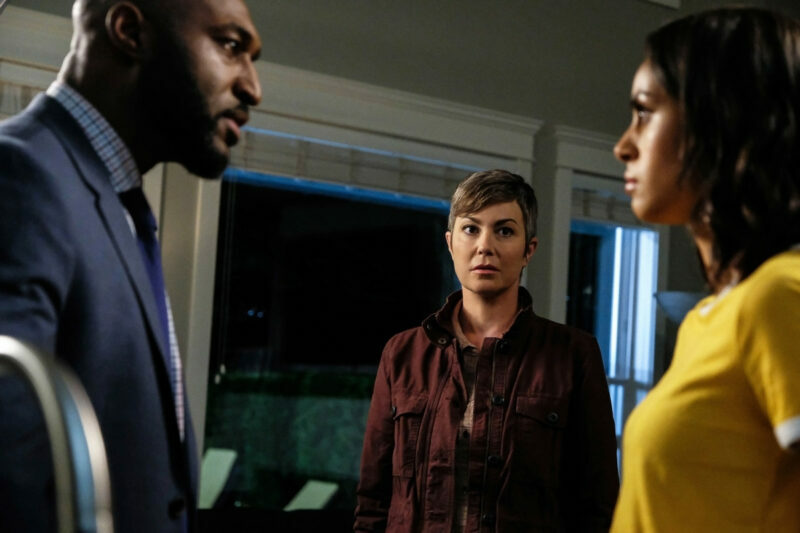 There is no doubt that Kim Rhodes has a wonderful, inspiring and empowering way of bringing Jody Mills to life. Every episode with Jody seems to have a special moment. Whether it is an important moment for the character or a just a moment we can personally connect with, something special seems to always take place when Jody graces our screens. Season 13 was definitely a big one for Jody Mills. 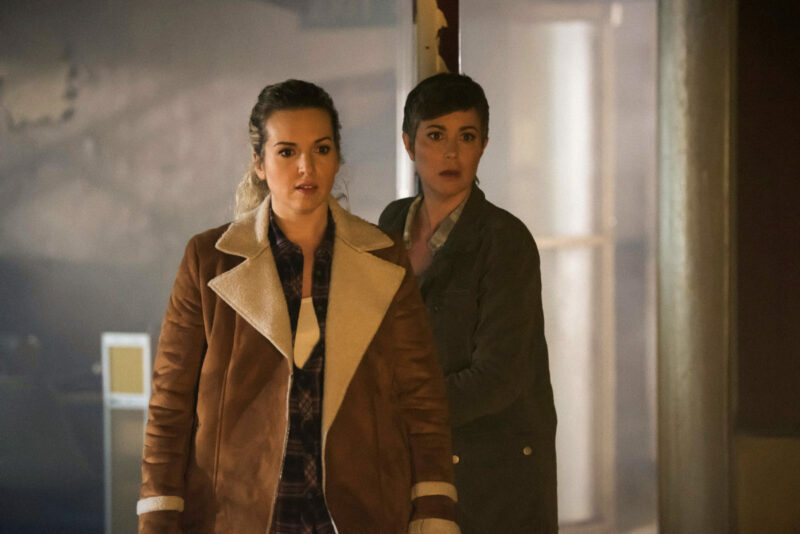 There was a lot of set up for the backdoor pilot “Wayward Sisters.” It started with episode 3 “Patience,” in which Jody helps Dean Winchester and Missouri Moseley on a case involving a wraith going after psychics. This of course introduced us to Missouri’s granddaughter Patience. In episode 9 “The Bad Place,” Jody is briefly in the episode at the end when Patience comes to her door with premonition. 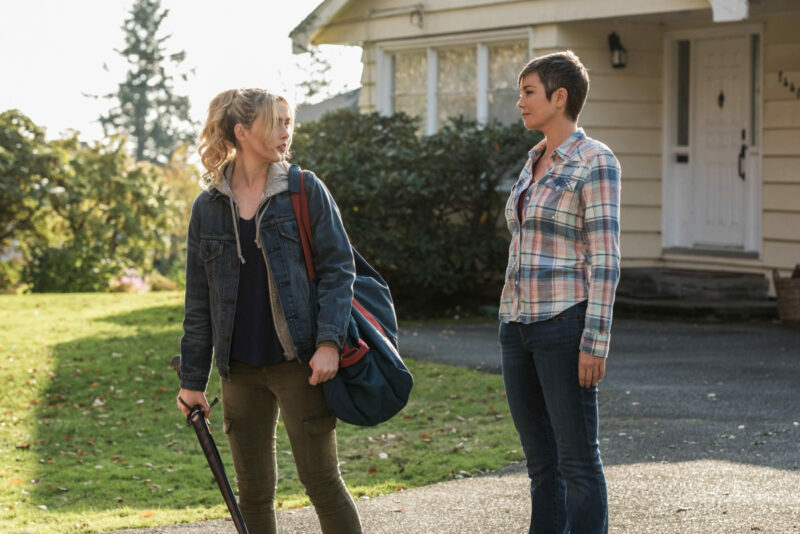 That premonition and the fact that Sam and Dean were missing leads to Jody’s biggest episode, episode 10 “Wayward Sisters.” We get a big glimpse of Jody’s home life, her relationships with Alex and Claire and her hunting life. That episode showcases her character in way we have only seen glimpses of before. Lets take a look back at our favorite moments from Jody last season. Towards the end of the episode, Dean and Jody are talking with Patience. Patience explains how her dad wants her to hang up the whole psychic thing and for her to have a normal life. Which Dean agrees with. He explains how hunting is nothing but heartache and death and that if she has a shot at normal, she should take it. After Dean walks away, Jody talks to Patience and tells her she doesn’t have to listen to either of them if that is not what she really wants. That it is her choice if she wants normal or to use her psychic powers. She explains that she had a daughter, Claire, and how she tried to give her a normal life and it did not work out. She followed that by giving Patience her card and telling her that if she ever needs someone to talk to, her door is always open. This moment was important for a couple reasons. First, it sets up a relationship for Jody and Patience. In the past, she has taken in Alex and Claire. She has made a home for two girls whose lives were affected by hunting. With Patience so new to her to gift, Jody is making sure she has a place to turn to as well. This shows how much Jody cares and protects. That is the heart of her character. The second reason it’s important is because Jody called Claire her daughter. The root of Supernatural has always been that family does not always end in blood. You do not necessarily need to be related to be family. Jody lost her family, but she found Alex and Claire, two girls she took in as her own. It also sets up one of the big focuses in “Wayward Sisters,” which is Jody and Claire’s relationship with each other. After Claire defeats a few werewolves and saves a young girl, Jody calls her. She explains that Sam and Dean are missing and that she needs Claire to come home. There is a big reason for that. Not just the facts that the boys are missing, but Patience’s vision as well. This scene was important for a couple reason as well. It establishes that despite Claire being on her own and hunting, Jody’s home is still “home.” I think it also sets up that Claire will always have a place to come home to. It is also a huge shout out to Supernatural’s pilot episode. One of the first few scenes between the brothers, Dean comes to Sam and tells him that, “Dad’s on a hunting trip and he hasn’t been home in a few days.” It shows just how important and special this backdoor pilot was, as well as how important Jody is that she delivered the iconic line. Later in the episode, as the group of women try to track down Sam and Dean, Jody and Donna split off to the abandoned shipyard where Kaia had opened the door to The Bad Place. Once they find it, Jody is determined to go in even though Donna is weary about it. But as Jody explains, she has to do it. If she does not, Claire will. She know how determined Claire is, and that she would never be able to be talked out of it. And Jody cannot lose another child. But her plan is thrown off course as the creatures from The Bad Place arrive and Jody and Donna now have to fight and protect themselves. This is a callback to the first episode we met Jody Mills, Season 5’s “Dead Men Don’t Wear Plaid.” Her son, who she had already lost, came back from the dead. But her undead son turned evil, and he attacked her husband. In a matter of moments, Jody lost her entire family. It is what makes her relationships with Alex and Claire special, because they have also lost so much. It is something all of them could relate to. And once again, Jody had a family. But in this moment, you can see Jody is scared she is going to lose another child, a child she considers a daughter. She is willing to risk her own safety, even her own life, to protect her girls. 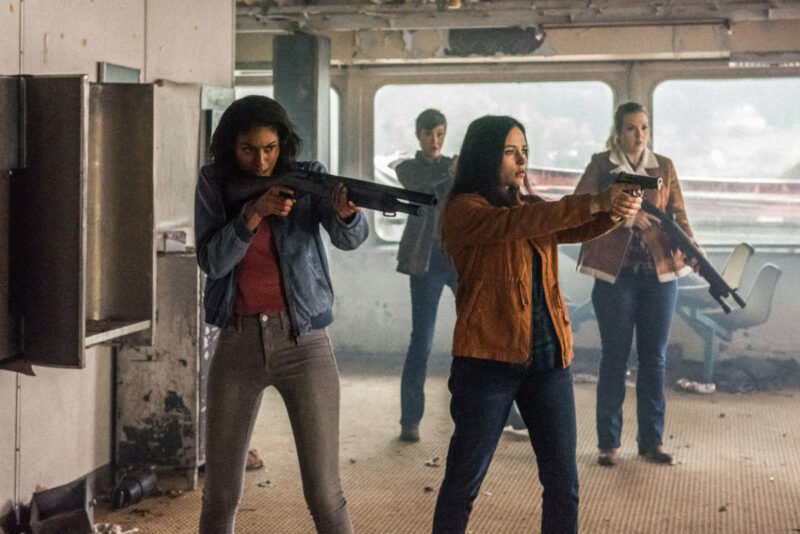 While Jody and Donna are hunkered down in an old, rusty car trying to defend themselves from the creatures, Claire arrives with a flamethrower in hand along with the other girls to save them. Shortly after this, Claire sees the door and runs toward it with Jody quickly behind her. This was a big step for Jody, letting Claire go. We know how much Jody wants to protect Claire, but she also knows that Claire also needs to do this. Jody is aware how important it is that Claire does this. And that it is a risk they all have to take because it is the right thing to do. It is a key turning point in their relationship with one another. On top of letting Claire go, there is also a gain of trust. Jody is trusting Claire that she can do this and that she has faith in her. Claire saves Sam & Dean with the help of Kaia, but unfortunately Kaia does not make it. She is killed protecting Claire, something Claire promised she would do. Sam, Dean and Claire come back through to their world and door closes behind them. Claire shouts “No!” and Jody comes in. She sees Claire distraught on the floor. She puts her gun away and goes to cradle Claire in her arms. With a look to Sam and Dean, and a shake of the head from Sam, Jody knows that Kaia didn’t make it. She knows why Claire is upset and continues to hold her in her arms, rocking her back and forth and trying her best to comfort her. In this moment we truly see how much Jody is a mother at heart and how much she truly loves these girls. She didn’t think twice to comfort Claire. She didn’t even know why Claire was upset at first, just that she was. She cradled Claire in her arms as if she were her own. And Claire didn’t fight it. While heartbreaking, it was a true mother and daughter moment. There was no doubt in this scene just how much love Jody had for Claire. 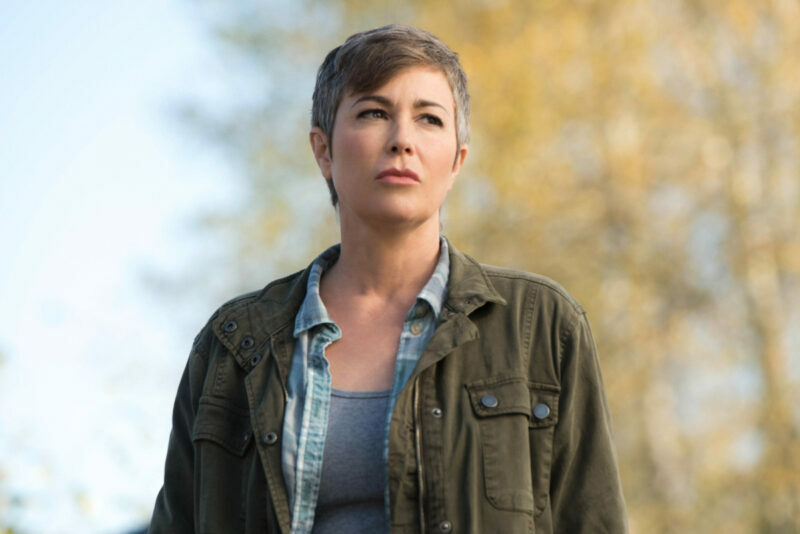 We already know that we’ll see a return of Jody (and all of the Wayward Sisters) in season 14 – but we don’t know yet what’s in store for her. What were your favorite Jody moments last season? What are you looking forward to? Let us know in the comments below! When Melanie isn’t writing for Nerds and Beyond, she’s doing her best to make professional fangirl a thing. She loves writing fan fiction, drawing fan art, reading comics and binge-watching like it’s a professional sport. Her list of fandoms just keep growing, and will always cite Supernatural and Psych as her first forays into fangirldom. Though Nancy Drew will always be her first real fandom. Melanie works hard at making her art a career and has dreams of becoming a published author someday. You can find her on Twitter @FangirlLanie. ‘Supernatural’ Season 11 Now Available on Netflix!